We manufacture and supply exclusive unit & multicolored Cotton Webbing. 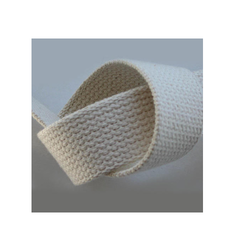 These webbings are made from the finest quality cotton, for meeting various industrial requirements. This multi purpose material is soft, easy to sew and is available in different specifications. Cotton Webbing Tape are widely used in bag packs, handbags and in garments because of non-allergic effect on body and also is easily dyeable. 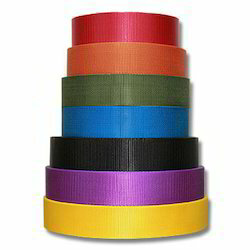 Being a leading enterprise of this industry, we are offering a huge range of Cotton Webbing Tape. We are the manufacturer and stockists of wide range of cotton tapes and cotton webbings made of high quality cotton yarn. These cotton tapes and cotton webbings are widely used in industrial purpose such as coil winding, armature winding and transformer core winding etc. Made from cotton these can be availed in different customized colors and widths as per the requirements of the customers. Cotton Webbing, cotton tapes newar for bag handles, web handles, cuffs of hand gloves, binding, etc. Understanding the growing needs of our clients, we offer an exclusive range of Cotton Niwar/ cotton tape. We also supply web and belts that are used for a variety of applications. - Available in various shapes and sizes. We are instrumental in offering Cotton Niwar to our clients. The Cotton Niwar is fabricated using various premium quality cotton yarns and latest technology at our high end manufacturing unit. These products are available in various colors, weaves and yarn count combinations. We are counted amongst prominent manufacturers, exporters and suppliers of coffee cotton niwar. The coffee cotton niwar is manufactured with fine quality coffee color cotton thread. Our coffee cotton niwar is widely appreciated for its appeal. We manufacture wide range of cotton webbing’s which is customized according to customers requirements. we offer an impressive range of cotton niwar suit the specific requirements of our esteemed clients’. They are available in various colors, weaves and yarn count combinations at industry-leading prices. - We specialize in making cotton webbings as per customers requirement. - We mainly use packaged dyed cotton yarn for webbing fabrications. We are the leading suppliers of cotton webbing in tirupur and we offering at reasonable price. Our range of Webbing Fabric are made of different fibers such as polyester, cotton, poly-propylene (PP), nylon and rayon. The above material used to manufacture our rigid tapes ensures its durability and quality performance. These are available in various attractive designs that cater to diverse application.